Cole Figueroa hit his third home run. Merrill Kelly hit two batters. Brandon Guyer threw out a runner trying for home. The Bulls won their sixth game in a row to reach a stunning 61-35 record. It didn’t rain (well, not too much). Does it get any better? Rumor has it the sun may come out today. I like watching Cole Figueroa play baseball. The 26 year old does everything well. A home run was just icing on the cake as he pushed his batting average over .300 yesterday (and he carries a very nice wOBA of .343). He’s .415 in his last 10 games, with 5 doubles and the home run to go with his 11 singles and only 2 strikeouts. To top it off, playing 3B last night he made a tricky bouncing ground ball to his left look routine as he handled it and got the second out in the 9th. Fun to have him with the Bulls this year. Mr. Kelly did more than just hit batters, of course. He’s been with the Bulls a little less than a month, made 6 starts, won 4 of them, and has a nifty 1.70 ERA. Very nice. Alex Colome has been placed on the DL and sent to Florida. Could be serious trouble. To replace him, recently signed Ramon Ramirez is coming up from Port Charlotte where he made one 3-inning appearance with the Stone Crabs. Speaking of transactions, this is a clever way to show the Triple-A All-Star game. At Bull City Summer, Adam Sobsey speculates on how the Bulls season might run out. 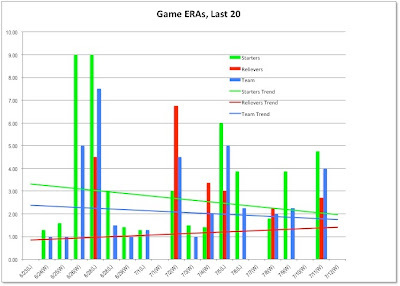 Another way to look at pitching performance, this chart shows the game-by-game ERA of Bulls pitching over the last 20 games, then plots a simple trend line for starters, relievers, and the team as a whole. What jumps out is that there were five games with no earned runs at all (with the additional oddity that in one of those games the Bulls lost, June 23). 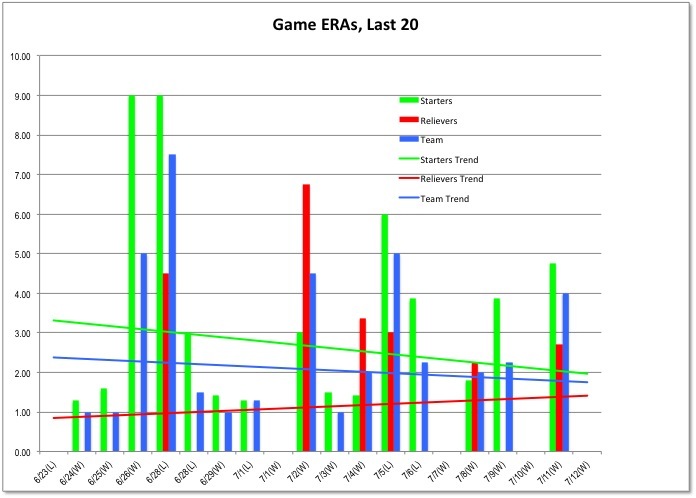 The pretty part of the trend is that, for the most part, neither starters nor relievers are allowing many runs. Of course, the Bulls won 14 out of those 20 games, an amazing number in its own right.